Stadion is a fence specifically developed for sports applications, realized also thanks to the cooperation offered by the technical experts during the Football World Cup. 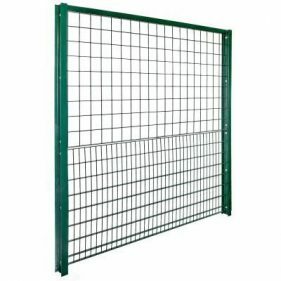 This collaboration has given life to a fencing system having in the upper panels, wires different center distance from the lower ones. This structure ensures good visibility, robustness and anti-climbing properties. 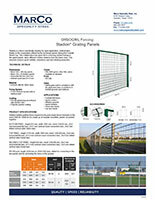 Stadion welded grating fence respond to the push loads forces foreseen in the norm UNI EN 13200 and it is made up of modular monolithic panels not jointed together. BOTTOM PANEL: height 933 mm, width 1995 mm, mesh 124 x 50 mm, 25 x 3 mm horizontal flat bars, Ø 4.5 mm vertical round connection bars, 25 x 3 mm drilled vertical sides frame bars. TOP PANEL: height 1174 mm, width 1995 mm, mesh 124 x 100 mm, 25 x 3 mm horizontal flat bars, Ø 4.5 mm vertical round connection bars, 25 x 3 mm drilled vertical sides frame bars. INCLINED TOP PANEL: height 540 mm, mesh 124 x 100 mm, 25 x 3 mm horizontal flat bars, Ø 4.5 mm vertical round connection bars, 25 x 3 mm drilled vertical sides frame bars. IPE100 post, length 2550 mm (or 2630+560 mm), drilled for connecting to the two panels and for anchoring the fence to the ground. H L Weight Section Fixing points L Weight galv. We invite you to contact Marco Specialty Steel today to learn more about the wide range of Stadion product options. We’ll also be happy to provide a no-obligation quote.